Truly absorbing account of such a dark,troubled,flawed genius. Superb writing allowing informative incite to all three characters within the confines of a 45 minute play. Felt exhausted and exhilarated by accounts of magnificent stage and tour victories. While tackling the tragic life of a sporting icon this wonderful play cleverly, light heartedly recognises the now well documented arrogance and skullduggery of Monsuier Armstrong and the lengths he went to physically and psychologically to beat The Pirate. 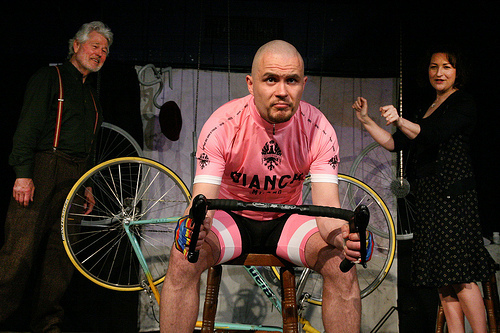 Must see play for all cycling,sport enthusiasts but equally moving human life tale for all audience. I have just been to see this play and cannot believe that 45 minutes could have been so moving. The writing and acting were excellent to the point that I am still trying to go about my afternoon without reflecting on the tradgedy and triumph of Marco Pantani’s life. I was in Paris for 1998 and went totally native for the ‘Tour’ that year. The distinctive figure of Marco Pantani was ever present and I followed too his subsequent decline. I cannot thank the author and actors enough for such an honest and absorbing portayal of a singular man. « UWS Graduate Looking For Studio Audience.